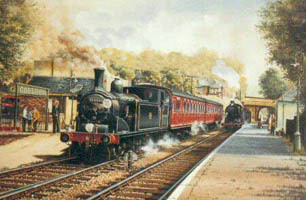 The construction of the Neath and Brecon Railway was a vital cog in the development of the South Wales coal industry. It linked many small collieries in the Neath and Swansea valleys to large industrial complexes and also provided a regular passenger service to Brecon which linked onward to Hereford ,Worcester and the West Midlands. 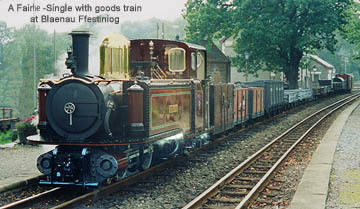 The first patented Fairlie Locomotive ran on the Neath and Brecon Railway. A Restored Fairlie Locomotive The two pictures of trains on the left show later Fairlie "singles". One of the original "double" boiler locomotives is shown above. Robert Francis Fairlie was a Scotsman, born in 1831, trained at Crewe and Swindon, Robert Fairlie joined first the Londonderry & Coleraine Railway, and then the Bombay, Baroda & Central India Railway. In the early 1860s he set himself up in London as a consultant and in 1864 filed his patent for what would later be known as the Fairlie locomotive. This was an articulated locomotive intended mainly for hauling heavy loads on twisting narrow-gauge railways. The first unit was built in 1865 for the Neath & Brecon Railway and had two pivoting power bogies and two boilers back-to-back (with smoke box and chimney at each end of the locomotive, a single firebox at the centre, around which was built the cab). 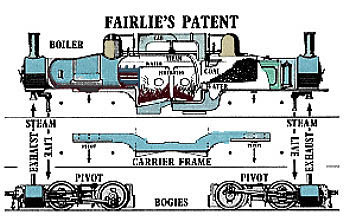 This was the typical Fairlie 'double-ender', although single-boiler and other variants later appeared. While the system provided a flexible coupled wheelbase, and freedom to include a large well-ventilated firebox, the flexible joints of the steam pipes tended to leak and the locomotives could only be safely used at low speeds because of overhang and other stability problems. 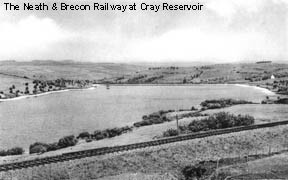 The Neath and Brecon Railway had 56 miles of track with 3 branch lines. At the turn of the 20th century there were eight steam trains a day passing through Penwyllt station: one each from Brecon and Neath crossing at 9.20am, and two more at 12.15pm. At 5.00pm there was a train to Brecon and at 7.00pm one to Neath. There were also two freight trains each day. 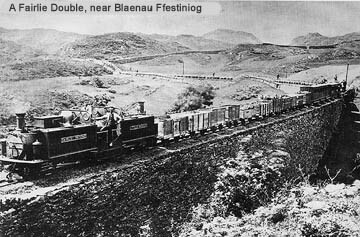 1862:Act of Parliament granted the ‘Dulais Valley Mineral Railway Co’ permission to construct a railway from Neath into the nearby valley. This was soon incorporated into the ‘Neath and Brecon Railway’, extending the route to Brecon via Coelbren with another branch to Swansea. 1864: Neath to Onllwyn section opened. 1869: Neath to Brecon line completed. 1873: Swansea to Coelbren Junction track opened. 1876: Midland Railway takes control of Swansea to Coelbren line. 1877: Midland Railway takes over rest of the network, allowing Neath and Brecon Co 30% of the revenue from the trains not running up the Swansea Valley. 1922: Great Western Railway absorbs the Neath and Brecon, and London Midland and Scottish Railway continues to run the Swansea to Brecon line. 1931: Great Western Railway takes over the whole system. 1962: Closed to passengers by Lord Beeching, but freight traffic from Penwyllt continued for about another 15 years.